As an emotional intuitive, I often find myself called into unchartered territory to be of service to help individuals and animals. It is in these moments that I witness the greatest potential for miracles. Synchronicity does not shout; it whispers, to see if you are listening and courageous enough to be of service. After a long hike on a Sunday afternoon, my husband and I were famished, but we had arrived at our favorite restaurant only to find that it wouldn’t be open for another hour. It seemed like an easy choice to simply find another place to eat. We decided to aimlessly tour the countryside for that hour and eventually crossed a street named after my hometown. We giggled and turned the corner. Strolling past the rolling hills of cattle, horses, and sheep; we felt at peace. Further down the road, I had a strange feeling as we approached a horse isolated in a small pen 25 feet in diameter. He was separated from a group of horses across the road. Intuitively, I could feel the pain and anxiety the horse was experiencing. I told my husband that something was wrong and he asked if he should pull over. Synchronicity had led me here to be of service so my darling husband happily obliged. Afraid to get out of the car for fear of overstepping personal boundaries, I could feel the inner struggle between being of service to this horse who couldn’t speak for himself and the fear of being yelled at or shot. But the horse’s suffering was too intense to disregard; I decided to act with courage. I approached the horse in his pen slowly, allowing him to see the loving intention in my eyes and heart. I telepathically let him know that I was there to connect with him and that I cared about what he was feeling. I felt an immediate burst of joy come from inside his heart. horse-eyeThe horse allowed me to feel his deep grief and anxiety. He felt unacceptable and alone. He felt a strong sense of panic, anxiety, humiliation, abandonment, and bewilderment. He didn’t know who he could trust and was terribly unhappy in the tiny pen filled with his own feces that he was left in. This left him feeling humiliated and rejected. The horse’s pen was one of those pens that had been used for breaking them. I saw a flash of the horse’s past where he was beaten into submission by previous owners, men who had whipped him repeatedly. The experiences had left him emotionally scarred. Being left alone in that pen told him that he was unacceptable psychologically. I could feel that no matter how many times he had tried to trust, he had been consistently betrayed, mistreated, and left alone. He longed to be free, grazing with the other horses in the pasture. Most people do not understand that horses, like other conscious animals, form attachments and have real emotions like humans. With all of this information, I knew I wanted to overcome my own fear of being misunderstood and potentially harmed in order to do what I could to help the horse relay this message to his current owner. I left a detailed note and my phone number with the owner and let the horse know that his wishes had been communicated. He responded by trying to play with me, grabbing with his mouth at the ends of my clothing to pull me in to the pen with him. He really wanted to connect with someone who saw him for the beautiful and intelligent spirit that he is. On our way home, I was surprised to receive a phone call from the horse’s owner and could therefore explain our chance encounter in more detail. “You are very in tune!” she said, to my surprise and delight. She told me that the horse had bonded with her daughter but since she had just had knee surgery, she was not able to get out to see him. This explained why he felt so abandoned and alone. She went on to tell me that the horse had seven previous owners, many of whom had severely beat him and forced him to do very hard work. Most recently, he had been relocated from Oklahoma where someone in their family had passed away. “Did you notice the broken gate on the pen?” she asked. “Yes,” I replied. “He broke free during a thunderstorm one night about two months ago” she said. Could you imagine being trapped in a small pen alone in the dark during a violent thunder and lightning storm? Just like you, the horse was afraid as he had no where to hide and was terrified. She didn’t understand that horses are just like people. We all need shelter and a place to feel safe. Even horses get scared. 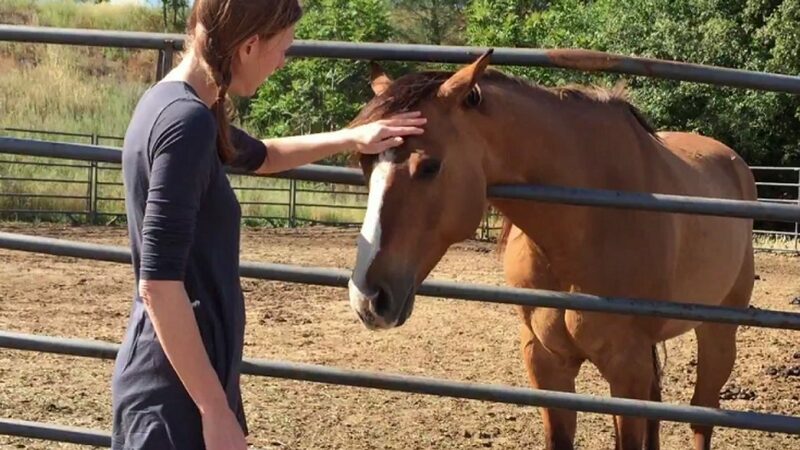 I offered solutions to help the horse adjust to his new home and family in a more interconnected way by possibly contacting the owner of the adjacent property to see if the horse could socialize with the others. She was very grateful and happy to respond to make the situation better immediately. I was happy that I did not allow my fear to get in the way of trying to alleviate the suffering of another being. It was an honor to communicate empathically with a beautiful life force who could not speak for himself. Many people do not understand the emotional intelligence of other species, but would be changed forever once they did. Words create division but we can connect universally through the empathic language of the heart. No matter what life form you find yourself engaging with, try practicing deep listening and speaking through the emotional compass of your heart. What you will discover is that the world is a much more interesting place.